I mentioned back in October that we’d fallen off the end of our business plan. Well-regarded consultancy, prototyping products with major clients? Tick. Our own products? Tick. So when we shipped Little Printer, I’m not kidding it was the oddest feeling – I felt like we were done. Since I got back from vacation mid January we’ve been working on a new business plan, one that takes us right into the idea of BERG Cloud as a platform. Over 2012, our consultancy focused more and more on connected products: In 2013, we’re actively prioritising collaborations that use and build our technology. In 2012, we shipped our first consumer product. Now, we’re working on on-ramps to the platform for everyone. Dev boards are in progress! The network is the new electricity. Connecting products is the electrification of the 21st century. And we want to be a big part of that. But announcements of our work in these areas are to come. Sadly, we have some other changes… Two of the team are moving on. Way back in 2005, when this place was still called Schulze & Webb Ltd, our first client was Nokia, our first project was Continuous Partial Attention, and the fella who hired us there was one Matt Jones. Then, in 2009, we joined forces. A little later the company became BERG, and we built the awesome, inventive, ambitious, fun, consultancy-and-product-hybrid that is the studio we have today. BERG has loads to thank Matt for. The consultancy business is a reflection of his insights and practices, and a good part of our intellectual foundations also come from him — our abiding interest in computer vision, “be as smart as a puppy,” immaterials… And, personally, I simply love his presence in the room. Matt’s keeping an involvement in the company, so we’ll still get the benefits – albeit less frequently – of his smarts, energy, and vision. So we can have that as consolation! We’ll continue to be fellow travellers. Simon’s been with us for two years, initially as our very first project manager – his remit was to invent the “BERG way” of running projects – and over time he’s taken on involvement in pretty much every part of how the company functions: Sales, budgeting, ops, supply chain and fulfilment, and more. Latterly he’s been Head of Little Printer, and he’s steered our first product from factory-ready to factory gate, then onto prioritising and launching features with the team, bridging product and marketing. Simon is creative and energetic — his first love is music, and he’s off for a new journey into that. We wish him the best of luck! We can’t replace Simon, just like we can’t replace Matt. We’ll each take on part of their old jobs, but I know there will still be something left undone… And I think what we’ll find is that whoever we bring in will have their own uniqueness, and they’ll fill that gap but do much more besides, and we can’t guess what that’ll look like. The secret of the name BERG is that it’s an acronym: the British Experimental Rocket Group. I said once that our experimental rockets are our people and that I’m always proud to see what BERG alumni move onto and accomplish. My aspiration is that at BERG we learn to think big – to invent culture! – and one day we’ll have a PayPal Mafia all of our own. So I’m proud, yes, of Matt Jones and Simon both, excited to see what they’ll do next, but it’s bittersweet because we’ll miss them! I’m prouder still of what the team is creating here at BERG. There are always opportunities in change. Our 2013 strategy is a corner-turn, and we’ll be able to grow in new directions from this. We’re moving premises, too, at the end of March – to somewhere higher up, somewhere with carpets instead of concrete floors, somewhere quieter with double glazing, a place for making and building. So that’s a geographic accompaniment to the changes. It’s a new chapter for us. Matt, Simon — I raise a glass to you both! Thank you for being with us on this journey, and all the best for your own new chapters! 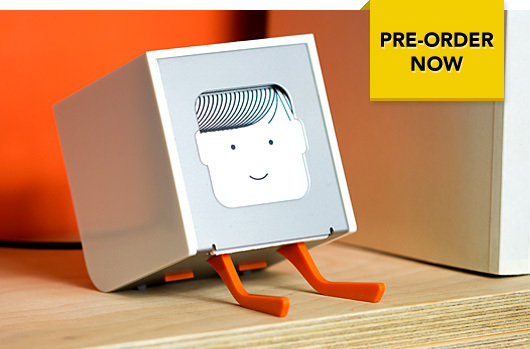 Little Printer available for pre-orders now! We’re celebrating! Little Printer is available for pre-orders from today. This is an incredible feeling. I love this studio. Awesome work, folks. The suite of UK education products we’ve been designing and building, codenamed Ashdown, is also known as School Report Card. I am extremely happy to say, today, that Ashdown is funded by an investment from 4iP/Channel 4. Read 4iP’s reasons for investing, and what TechCrunch Europe find interesting. For us, it’s the ideal project: Ashdown has to be beautiful, inventive and mass-market. There’s the humanising of big data, with big information design and technical challenges. And it’s about citizenship. Giving people tools to know and understand more, to have agency in the world and to work together – as parents, teachers, pupils and government – to improve schools and society. These are all goals and qualities we care about deeply. It’s an important moment for us, too, an opportunity for BERG to put its product and design instincts on the line. And, strategically, Ashdown is in an good space for us, sitting neatly between client services and our self-funded new product development. It brings good balance to the studio. We love working with the folks at 4iP, and we’re totally looking forward to seeing where this takes us. It’s been full of great challenges already. Check out our posts about Ashdown so far for a taste of our approach. More in the coming months! Jack Schulze and I dispute where we met, but I know when we first worked together. In 2005 he offered to have his students design icons for some experimental social software I was making. He showed me the options, and the best one had gone against specific requirements in my brief. I picked it anyway. It wasn’t from any of his students it turned out. He’d done the work himself and put it under my nose secretly. Schulze & Webb Ltd isn’t the original name of the company. Schulze and I renamed an off-the-shelf company we bought in summer 2005 — that’s often the easiest way to start up in the UK. So for a while the company was called Z.V.B. Ltd. “What does that stand for, Zero Version Behaviour?” said Schulze’s dad. And that particular company was formed 1 June 2005. I like that it pre-dates us, if only by a few weeks. In the summer of 2008 we began the Dayuejin. It’s important to name the eras of a company. It gives a sense of purpose, and of history. The Dayuejin is also known as the Great Leap Forward. To make the products we wanted, we needed more money petrol, which needed bigger projects, which needed more people and a bigger studio, which needed more money, which needed our own projects to build confidence. Everything had to move forward at once. It took a year, more or less, to find the right way to do it and lock it in. The current era started last week. It’s the Escalante, the Grand Staircase. We’re in the third stage of the business plan I wrote in 2006. Tom Armitage started with us as lead developer and writer at the beginning of 2009. Matt Jones joined mid this year. This is an invention, strategy and new product development design company. Schulze looks after NPD. Matt Jones looks after design and client services. I help keep the wheels turning. In addition to Tom, there is a network of expert practitioners in electronic and mechanical engineering, industrial design, print, 3D, animation, videography, visualisation, data-mining, coding and technical development. We have growing experience in more and more of fulfilment and the supply chain, with patents in progress, and some neat products either out of the door or in development. I look at the ideas, people, projects, ways of working, products in development, our friends and culture, and I have to say it: I’m proud. S&W laid the right foundation, and it’s bittersweet to say goodbye to this part of our lives. We need a name for the next four years. I’ll ask Schulze to say more about the brand in the coming days. For the moment, from all of us, welcome.